"The father of us all." Live sports broadcasting as we know it today began in 1923 when young Graham McNamee, broadcasting directly from the Polo Grounds in New York City, reported the World Series between the Yankees and the Giants. The experiment was so successful that Chicago radio station WMAQ was inspired to pioneer daily broadcasts directly from the baseball park. 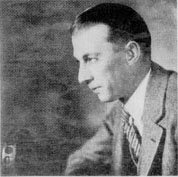 McNamee, who started out as a concert singer, set many broadcasting standards throughout a lengthy career which spanned the years from 1923 until his death in 1942. His vivid descriptions of the events which took place before the live microphone were characterized by a combination of informality and warmth that appealed greatly to his listeners. Among those great moments in sports history that he broadcasted, McNamee ranked three as among the most memorable: the fabled long count of the Dempsey-Tunney fight in 1927, the comeback of Philadelphia Athletics pitcher Howard Ehmke, in the 1929 World Series, and the Babe Ruth home run in the 1932 World Series.